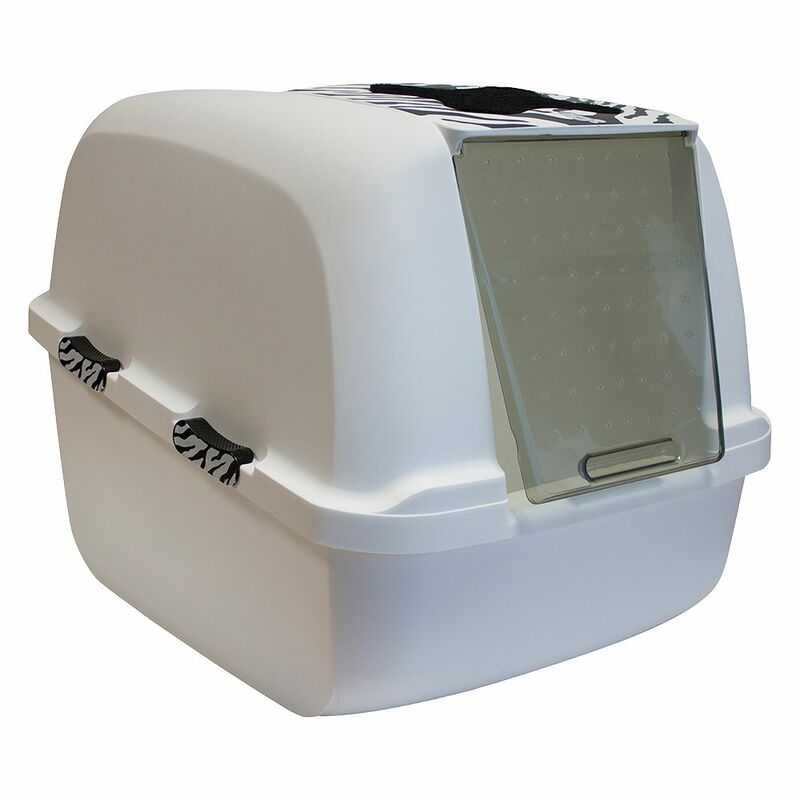 The White Tiger Catit Jumbo is a large, roomy litter box with a fashionable tiger pattern and will look good in any bathroom. It is spacious enough for larger cat breeds or multi cat households. The White Tiger Catit Jumbo has a transparent swing flap and an activated carbon filter which helps to prevent nasty smells escaping from the litter box. The tray has an extra high edge so it is absolutely leak-proof. It has two added extras to make cleaning easy: The hood is removable so the inside is completely acceΒible and there is a bag anchor at the front where you can secure the waste bag when scooping out the soiled litter. The hood and tray are quickly and firmly connected with sliding clips and there is an integrated handle on the top. Catit Jumbo White Tiger litter box at a glance: Colour: white with tiger pattern Very roomy Ideal for larger cat breeds Activated carbon filter Handy waste bag anchor Hood opens up Transparent plastic swing flap Dimensions: Total: 57 x 50 x 46.5 cm (L x W x H) Door opening with swing flap: W 21-24 cm x H 26 cm Tray height: front approx. 17 cm, back approx. 28 cm Entrance height: 17 cm Click here for more information on the Catit Litter Scoop!.